The only reason people, the world over, haven't realized the illegitimacy of their governments is because of reality management techniques such as propaganda, combined with a bountiful amount of bread and circus, is a powerhouse of distraction and obfuscation. Why bother learning about the truth when the football game is on? But during election times, the people's focus is ephemerally cast on to the government once again. This time around, it appears the population at large is recalcitrant to political rhetoric, as revealed by the below poll numbers taken last week. Americans have a very bitter taste in their mouths, and rightly so, but are they ready to make the full leap into acknowledging reality? On their own, maybe not, but with a little help from their friends, those of us who have been gaining key knowledge and understanding, the whole truth can be acknowledged. Isn't it high time we abandoned fallacious governments and started working together to make the world a better place for ourselves and our children? Our participation is required, we can't delegate this task to anyone else. So let us take the time to gain key knowledge and start the process of uniting for change. Because the enemies of freedom and truth are united, and if we want to restore our own freedom, so must we. Reading the sentiments of polled people below, doesn't it seem obvious that people want real freedom and change? 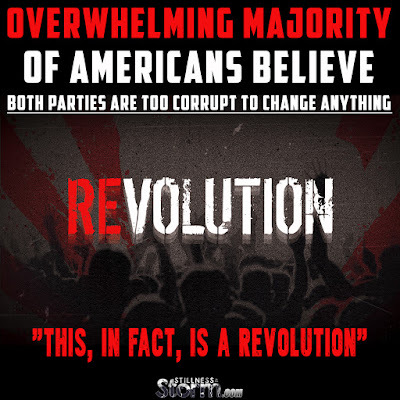 We’ve previously noted that polls show that Americans are in a “pre-revolutionary” mood, that less than 1 in 5 Americans think that the government has the “consent of the governed”, that government corruption tops the list of Americans’ fears (gee, we wonder why), and that 3 times as many Americans supported King George during the Revolutionary War than support our OWN Congress today. You might assume that such statements are over-the-top … or that the results come from partisan pollsters.